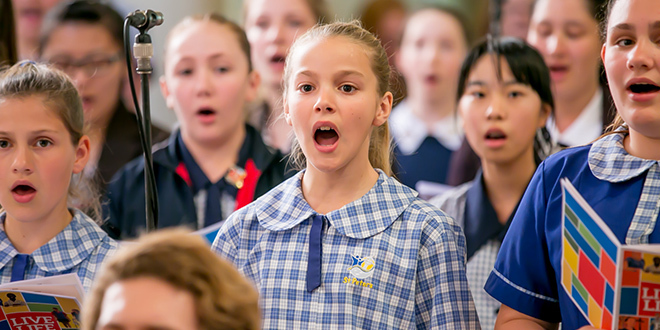 Voice of praise: Members of the choir at the Catholic Education Week Mass in St Stephen’s Cathedral, Brisbane, last Sunday. STUDENTS and representatives from many Catholic schools in Brisbane archdiocese gathered in St Stephen’s Cathedral last Sunday afternoon for a Mass to open Catholic Education Week 2014 (July 27-August 2). Archbishop Mark Coleridge was principal celebrant and CEW ambassadors Annabel Pike and Michael Mangan attended. Archbishop Coleridge also officially launched Catholic Education Week at St Laurence’s College, South Brisbane, on Wednesday, with a range of schools participating. CEW 2014 focused on the theme “Come, live life in all its fullness”, which was based on the Gospel of John (10:10).